Abercrombie Room: Contemporary spaces have been expertly put together by Unlisted Collection. 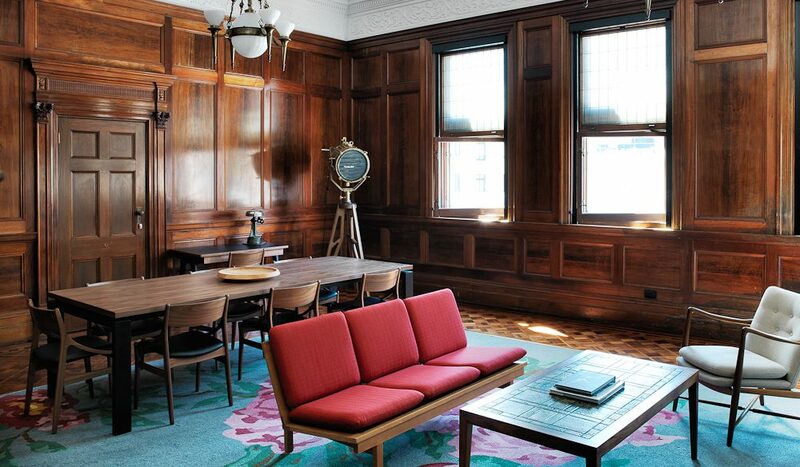 Lara Picone checks out the Old Clare Hotel, a curious mix of grit and glamour. Once the room door clicks open, I begin my habitual ‘entry and evaluation procedure’. First, a cursory glance of the room (more detail given to the bathroom), followed by flinging my bag on the nearest chair, then most importantly, swinging open the mini bar. Much like gaining insights from a sneaky peek in a bathroom cabinet, the mini bar reveals a lot about a hotel. Just a glance and you get a sense of what you might expect from your stay. Following standard entry procedure at The Old Clare Hotel on this evening, my fridge inspection draws a slight gasp. I call my partner over to offer an opinion, ‘What’s that doing in there?’, I ask, brow furrowed. Next to a negroni cocktail conveniently premixed for two (I’m much obliged!) sits four tinnies of Melbourne Bitter. Now, I’ll guzzle a tinnie as happily as the next person, but I’m accustomed to being greeted with local craft beer in boutique hotel rooms these days. The jolly, red tinnies jarred expectations. After all, this is Chippendale, Sydney’s newest crown prince of hipsterdom. Then the penny dropped. Yes, it’s Chippendale, and this is the former Carlton United Breweries Administration building. The Melbourne Bitter cans and the Reschs on tap downstairs in The Old Clare bar are giving a wry smile in acknowledgment to the building’s heritage-listed past. Joined by a parallel history and now by a sleek glass and steel atrium, the CUB building and The Old Clare pub (also heritage-listed) create one of Sydney’s newest boutique hotels. Reclaimed and re-imagined by design group Unlisted Collection, the former brewery and hotel have transformed into 62 rooms, a bar, and two exceptional restaurants, Silvereye and Automata, with another, Kensington Street Social helmed by Michelin-starred chef Jason Atherton, on the way. Opening its doors with the required dose of swagger to get noticed in Sydney, The Old Clare ticks the boxes for cool city accommodation. There’s even a rooftop lap pool and bar (the bar wasn’t open on our visit), complete with sun umbrellas and an urban edge provided by way of a billboard and the adjacent apartment building presiding over poolside activity. Beneath the rooftop, rooms have an industrial feel with attention given to exposing as much of the beautiful original brickwork as possible. There are custom light fittings, a dreamy, super-king bed, and New Zealand toiletries brand Triumph & Disaster to help you freshen up before hitting the streets. The bathroom itself is a savvy use of space, even if (in the ‘Connell’ room, at least) it’s little more than a glass box. The toilet is thankfully housed in a frosted glass box but the shower offers no such modesty, which could make things awkward if you were sharing the room with anyone but a significant other. It’s all quite sleek, even if marginally lacking in real attention to detail. Downstairs, the lobby is plastered with band posters and is connected to The Old Clare Hotel bar by way of an open door. As the noise picks up in the bar, so, too, does the lobby-noise escalate, causing slight irritation to guests checking in after dark. 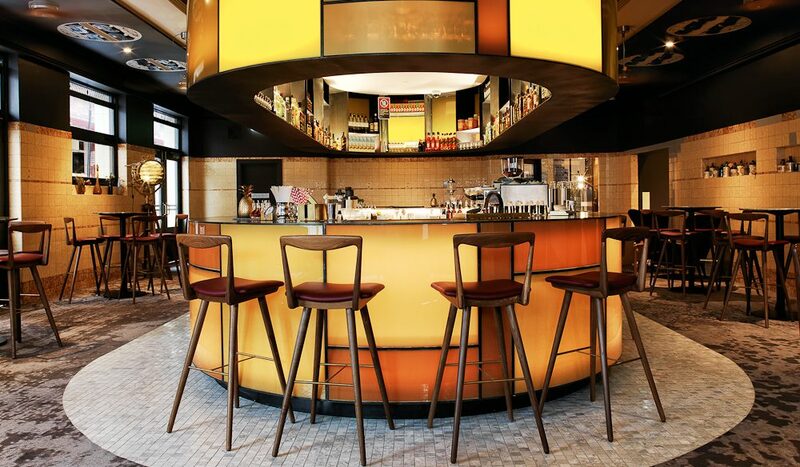 In its recent history, the bar was a rowdy haunt for grungy students, now it’s the sort of place where napkins are placed under drinks served to white-collar city workers, such is the gentrification of this once city-fringe suburb. The Old Clare Hotel is well-positioned to make the most of this new frontier of cool and accommodation of its type is sorely needed down this end of town. With its beer-brewing backstory, this new boutique hotel has the right amount of grit and glamour to fit in. Still, for the wallet-straining cost of one night’s stay, it’s just as well the mini bar is stocked with tinnies. 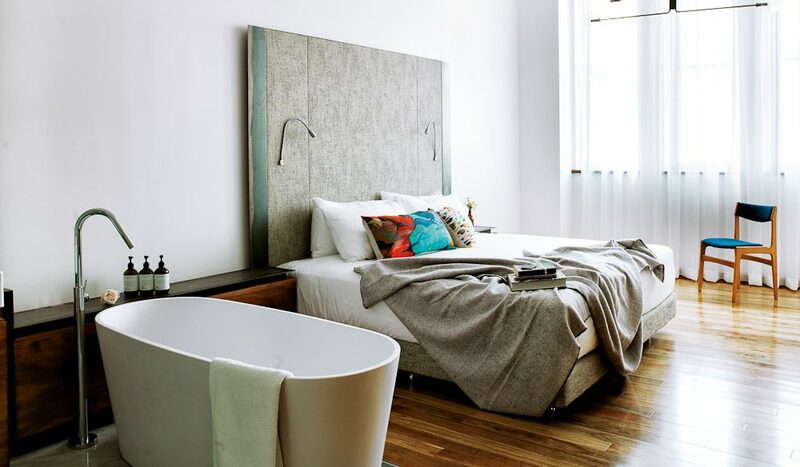 Verdict: Sleek city lodgings in a good location for exploring the surrounding suburbs of Surry Hills, Redfern and Newtown. We rated: The lovely, lazy 11am check-out time. Also, the adjacent Kensington Street precinct. We’d change: The service was unrefined for an establishment of this kind. Notes: We paid $349 for a night in the Connell room; add an extra $50 for breakfast. The top-of-the-line C.U.B suite comes in at a cool $2349 per night and has its own library, so we hear.